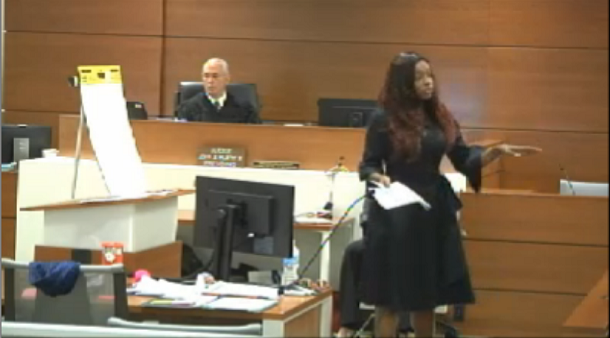 Lakiesha Cannon delivers her closing argument in Santoro v. R.J. Reynolds, et al. Fort Lauderdale, FL—A Florida smoker’s widower was awarded $1.81 million last week for the lung cancer death of his wife, wrapping a rare Engle progeny trial against three of the country’s four biggest tobacco companies. Santoro v. R.J. Reynolds, et al., 2008-CV-025807(19). Jurors awarded Charles Santoro more than $1.6 million in compensatory damages Wednesday for the lung cancer death of Grace Santoro, 66. Two days later, the 17th Circuit Court jury imposed a $205,000 punitive verdict against the tobacco companies it found responsible for her death. That award included $100,000 levied against Philip Morris, $90,000 against R.J. Reynolds, and $15,000 against Liggett Group LLC. Grace Santoro died from lung cancer-related complications in December 1998, after nearly 50 years of smoking. Her husband claims the tobacco giants are responsible for his wife’s death by hiding the dangers of smoking through most of the 20th century and hooking Grace Santoro on their cigarettes, which ultimately caused her fatal cancer. Charles Santoro’s attorneys sought $16.5 million, including $9.5 million in compensatories and $7 million in punitives, during closing arguments last week. The Santoro case is one of thousands of Engle progeny cases in Florida, which stem from a 2006 Florida Supreme Court decision decertifying Engle v. Liggett Group Inc., a class-action tobacco suit originally filed in 1994. Although the state’s supreme court ruled that so-called Engle-progeny cases must be tried individually, it found plaintiffs could rely on certain jury findings in the original case, including the determination that tobacco companies had placed a dangerous, addictive product on the market and had conspired to hide the dangers of smoking. However, while Philip Morris and Reynolds, the nation’s two largest tobacco companies, are common defendants at Engle trials, Liggett appears relatively rarely. The company, the fourth largest cigarette manufacturer in the U.S., has settled most of the pending Engle litigation against it. Liggett last appeared in front of CVN cameras for an Engle trial in 2015, a defense win in Shulman v. R.J. Reynolds. Beyond the traditional issues of addiction and causation central to each Engle progeny case, a key to the nine-day trial was whether Santoro’s lung cancer developed before the November 21, 1996 cutoff date for Engle class membership. During Monday’s closings in the trial’s first phase, Shook Hardy’s Peter Henk, representing Philip Morris, told jurors there was no direct proof to show Santoro had cancer before the cutoff date. Henk reminded jurors Santoro was not diagnosed with cancer until July 1997 and a medical report made about the same time declared Grace Santoro had no tell-tale symptoms of cancer until earlier that year. “The medical record is the only reliable evidence on this issue,” Henk said. Kasowitz, Benson, Torres & Friedman’s Kelly Ann Luther, representing Liggett, maintained there was not enough evidence to link the company’s cigarettes to Santoro’s cancer. During Wednesday’s closing arguments, Luther noted Chesterfield was the only Liggett brand among many that Charles Santoro said his wife smoked for decades. However, Luther argued Charles provided vague and contradictory testimony on his wife’s history, if any, of smoking Chesterfields. “He couldn’t say for certain that he ever, ever remembered seeing a pack of cigarettes around Mrs. Santoro,” Luther said. But plaintiff’s attorneys argued the tobacco companies’ participation in a sweeping conspiracy to hide the dangers of cigarettes rendered them all responsible for the scheme’s effectiveness in duping Santoro and ultimately hooking her to the cigarettes that caused her cancer. That addiction, Cannon added, led to lung cancer that started well before the 1995 cutoff date. Expert testimony, Cannon said, concluded Santoro must have had cancer before the 1996 cutoff date based on the size of her tumor when doctors discovered it in 1997. In rendering their verdict, jurors apportioned 28% of responsibility for Santoro’s fatal cancer to Philip Morris, 26% to Reynolds, and 10% to Liggett. The remaining 36% it apportioned to Santoro herself. Under controlling Engle case law in the 17th circuit, the apportionment of fault will likely reduce the compensatory award to $1.024 million. However, punitive damages are not subject to such a reduction. Charles Santoro is represented by Lakiesha Cannon and Koch Parafinczuk, Wolf & Susen’s Austin Carr. R.J. Reynolds is represented by King & Spalding’s Jason Keehfus. Philip Morris is represented by Gass Weber Mullins’ Joseph Fasi and Shook Hardy Bacon’s Peter Henk. Learn about CVN's unrivaled tobacco litigation coverage. Topics: Negligence, Products Liability, tobacco, Florida, Santoro v. R.J. Reynolds, et al.